Shoulder & Neck Training Like A Beast! 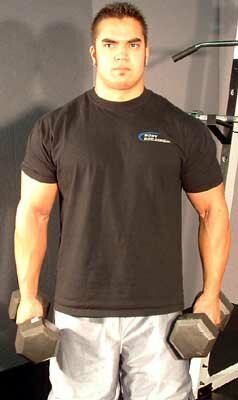 Muscle-Specific Hypertrophy Workouts! Get detailed anatomy information about the deltoid and trapezius including some great workouts for those areas. Learn more below and try these great upper body workouts! Nothing stands out on something like a nice pair of deltoids (shoulders). Whether the shoulders are large and wide or tight and toned, they are an eye catcher. More important to the integrity of the shoulder joint itself is the muscle deep to the shoulders, collectively called the rotator cuff muscles. The trapezius also plays a role in shoulder stability. We discussion will begin with the superficial deltoid. Nothing Stands Out Like A Nice Pair Of Deltoids. Like many other muscles in the body, the deltoid is divided into distinct fiber portions. The anterior deltoid originates from the lateral third of the clavicle, the middle deltoid from the acromion process, and the posterior deltoid from the spine of the scapula. All three portions of the deltoid muscle insert on the deltoid tuberosity of the humerus. Because the three portions of the deltoid each pass over a different part of the glenohumeral joint (shoulder), they each have a distinct action. The anterior fibers flex and medially rotate the arm, the middle fibers abduction the arm, and the posterior fibers extend and laterally rotate the arm. The rotator cuff aids in stabilizes the shoulder joint by holding the head of the humerus in the glenoid fossa of the scapula. It is made up of four muscles, all of which assist in the movements of the deltoid. Three of the four muscles originate posteriorly, with only one originating anteriorly. The most superior of the three posterior rotator cuff muscles is the supraspinatus. It originates from the supraspinous fossa of the scapula. The infraspinatus originates from the infraspinous fossa of the scapula. Finally, the teres minor originates from the lateral border of the scapula. All three muscles insert on the greater tubercle of the humerus. The supraspinatus acts alone and assists in shoulder abduction. The infraspinatus and teres minor on the other hand, work together as lateral rotators of the arms. They also maintain the position of the head of the humerus during other arm movements. Though the teres major originates near the teres minor, its function is more closely paired with latissimus dorsi due to its insertion. The teres major originates from the inferior angle of the scapula and inserts on the medial lip of the intertubercular groove of the humerus. The teres major assist the latissimus dorsi in extension, adduction, and medial rotation of the arm, but only when there is resistance against these movements, such as during weight training. The only anterior muscle of the rotator cuff is the subscapularis. The subscapularis originates from the subscapular fossa of the scapula and inserts on the lesser tubercle of the humerus. It is a medial rotator of the arm. Of even greater concern is the subscapularis&apos; job of preventing anterior dislocation of the head of the humerus. The trapezius is the easily distinguishable muscle superior muscle of the neck/back, is divided into three different groups: the superior fibers, middle fibers, and inferior fibers. Because of the many origins of the trapezius, each of these areas of fibers performs a different action. The trapezius as a whole originates from the external occipital protuberance, ligamentum nuchae (the ligament of the back of the neck), and spinous processes of the last cervical and all thoracic vertebrae. All of these fibers insert on the lateral third of the clavicle, acromion process and spine of the scapula. As a whole, the trapezius upwardly rotates the scapula. Individually, the superior elevation the scapula, the middle fibers retraction the scapula, and the inferior fibers depress the scapula. Move your mouse over the following links for information on the specific muscles. Move Your Mouse Over The Muscle Links (Above) To See Details. Note: Alternate exercises with the same number, resting 1-2 minutes between each exercise. Click Here For A Printable Log Of Workout A. The military press is great for overall deltoid development, though it hits the anterior delts the hardest. How far you bring the bar down is a personal preference in my opinion. Some people will recommend stopping at your nose, chin, and bringing the bar all the way down to your upper chest. I say find what feels most comfortable for you. 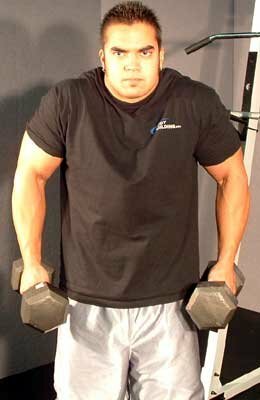 Heavy barbell shrugs are great for trap growth. While emphasis should be placed on lifting a heavy load, the load should not be so heavy that your form and ROM suffers. As you shrug, think of trying to touch your traps to your ears. This is how high up you should strive to shrug the bar. The reason why I included rear delt laterals in this program is the posterior head of the deltoid is often underdeveloped in bodybuilders and this stems from not directly working it. 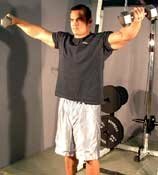 The posterior deltoids can be hit by doing bent over DB lateral raises, bent over cable lateral raises, or rear delt flyes on the reverse pec dec. 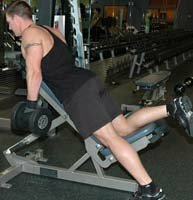 The main thing to focus on when trying to hit the rear delts is actually USING the rear delts. You should be able to feel the rear delts contracted with each rep. If you cannot, you are most likely using too much weight and need to decrease it and increase your ROM. 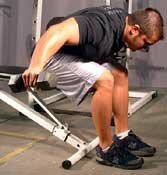 Using too much momentum on bent over DB laterals will also cause you not to use the rear delts to the full extent. 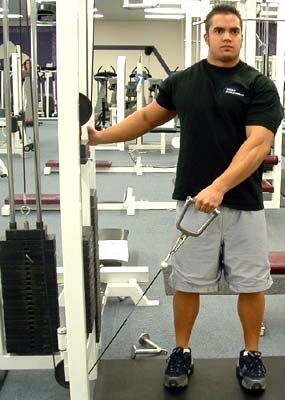 DB shrugs allow you to use a greater ROM than barbell shrugs, which can lead to the stimulation of more muscle fibers. Click Here For A Printable Log Of Workout B. Like the military press, the DB shoulder press is great for overall shoulder development. 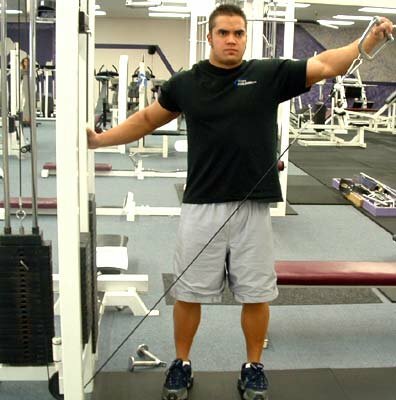 This exercise is executed just like the military press except the use of DBs makes each arm work independently. 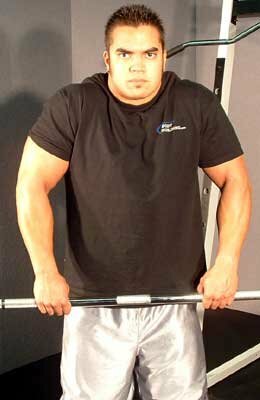 Behind the back shrugs are done just like standard barbell shrugs but with the barbell behind you. This change in position of the bar increases the recruitment of the middle and lower fibers of the traps. These lateral raises target the middle deltoids. Increasing the size on the medial delts will give your shoulders a round, full look. The key to these exercises is not using momentum or your traps to lift the DBs and pull the cables. You want to keep the tension on the medial delts. This can be done by bending the elbows slightly and rotating your wrist so your pinky is higher than your thumb (a trick used by Arnold Schwarzenegger). 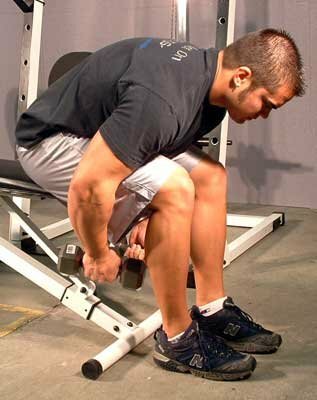 Prone DB shrugs done lying on an incline bench allow you to hit the middle and lower fibers of the traps to a greater degree than the standard shrug. Instead of shrugging the weight straight up when standing, you want to squeeze the mid-back/traps together to lift the DBs on this exercise. Derek "The Beast" Charlebois is an ACE certified personal trainer, competitive bodybuilder, and holds a Bachelor&apos;s degree in Exercise Science from The University of Michigan. Derek is the Promotions Coordinator/R&D at Scivation/Primaforce and is involved in coordinating promotions, research and development, advertising, and marketing.